Tip: The Agent is also selling an Exotic Helmet engram. Plan on buying Mask of the Third Man and a Helmet Engram? Buy & decrypt the Engram first to avoid a potential duplicate! In addition, Exotic Engrams will generally provide better stats for an item. For example: If you were to receive Mask of the Third Man from the Engram, it’d most likely have better stats than what comes default from Xûr. You may not want to buy it. It’s not good enough to really justify the purchase, unless you just have extra Coins to spend. 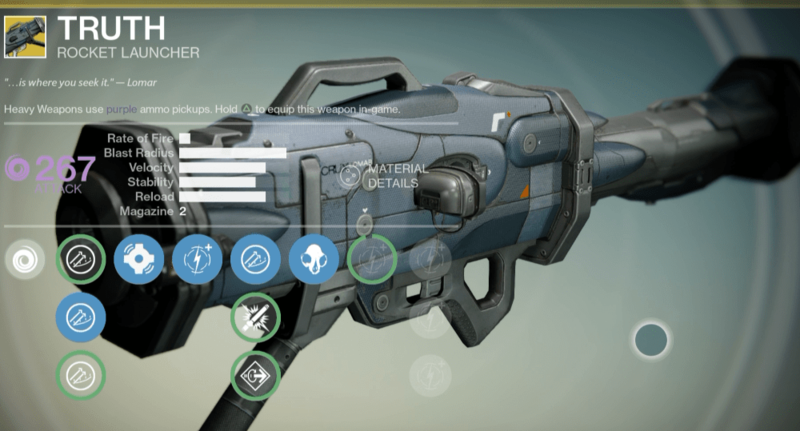 It’s going to serve you very well in the Crucible, but how much are you really going to use it? If you’re in need of a Void-based Rocket Launcher it’s definitely a fine choice, but if not, save up for next weekend. Aggressively tracking missiles that explode based on proximity to a target could use a buff as well, since it’s not much different than the normal tracking that some rocket launcher’s provide. Truth takes all of the good features of a rocket launcher (2 shots, tracking rounds, explosions on proximity, large blast radius, good velocity and reload) and puts them into one package. Is it worth using? Absolutely. But if you’re short on Strange Coin, just save them for the next time there’s an even better (primary/special) weapon for sale! This chest is one for those that love team oriented play. While it won’t be incredibly useful in the raid, this chest piece really holds its own in 3v3 and Strikes. This is a helm that every Bladedancer should own. In addition to increasing your melee speed, it decreases the amount of super energy used, which can make for some extremely long killstreaks. While the Bladedancer subclass isn’t the best for raiding, this helm is has perks that will always benefit you (but only you). Infusion – Replenishes health each time you pick up an Orb of Light. Switchblade – Increases melee attack speed. Unstable Current – Arc Blade attacks use less super energy. Mask of the Third Man, being the only Exotic helm that’s specific to the Bladedancer, is a great choice if you enjoy that subclass. You’re going to always make use out of the Switchblade perk since you’ll undoubtedly be using your melee a lot. Exotic helmets are one of the only ways to hit 30 if you don’t plan on clearing VoG on hard, so if nothing else this could help you raise your Light level. Go ahead and buy this unless you’ve all but retired your Bladedancer! A frequent product from Xûr! As with every class, there’s only 1 Exotic gauntlet (more coming in the expansion). The Sunbreakers, with such as awesome item description, are pretty lackluster. Serpent’s Tail – Causing damage with a melee reduces your grenade cooldown. Helium Cycle – Increases the duration of your Solar Grenade. The perks focus on the use of grenades – specifically Solar Grenades. If you’re a Sunsinger, chances are you probably already own them since it’s one of only two Exotics specifically tailored for Sunsingers, the other being Heart of the Praxic Fire (which has much different talents). Ultimately, it comes down to this: do you really like Solar Grenades? Do you need an Exotic to raise your Light level? Here’s your chance. Again. Next Post:Saturn/Europa in Destiny’s Sequel?